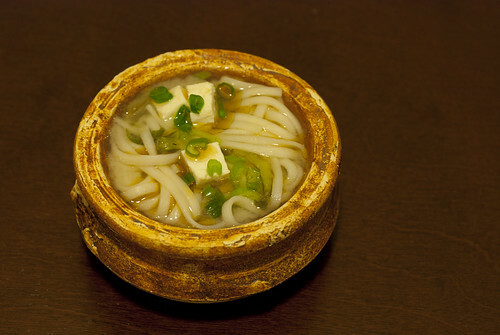 When I was in college one of my favorite things to prepare was udon noodle soup (usually the instant kind), with some tofu, enoki mushrooms, and an egg thrown in. The instant packets available at the supermarket typically contain fish, and aside from that are filled with all kinds of things that aren't altogether too healthy. These days I like to make my udon soup from scratch. For a little added flavor and substance in my broth, I just add a little miso. Put your water in a large pot and bring to a boil, then reduce to a low simmer. Add in the miso, stirring until it is well dissolved (be sure not to boil the miso!). 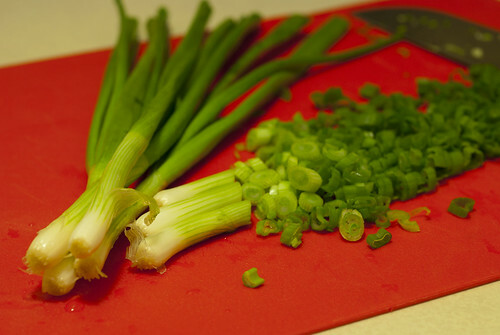 Add in the bok choi and scallions, and allow them to simmer and soften for approximately 10-15 minutes. While the vegetables simmer, chop your tofu into 1/2-inch cubes. After the bok choi stalks are sufficiently soft, add in you tofu and noodles, and stir in the sesame oil. Season to taste with pepper, and hot sauce, if desired. This is a great, super-simple soup base, and you can throw anything in that you like! I used extra-firm tofu because that's what I had on hand, but it's especially good with firm silken tofu. You can also use red or brown miso for a stronger flavor (white miso is the most mild). I'd also recommend trying this soup with seaweed (just simmer it in the water first thing, for about 5 minutes, before adding the rest of the ingredients) and enoki mushrooms.